Beleaguered snack chain Old Chang Kee on Tuesday afternoon released a statement in response to the incident where an unidentified insect was found in one of its signature sardine puffs. Just before 4:30pm, the company said in a post on its Facebook page that it had apologised twice to 32-year-old Sandra Jana, who discovered the insect (pictured above) in a sardine puff she purchased from the outlet at the Singapore Post Centre last Wednesday. "We have apologised to the customer on two different occasions for her unpleasant experience," they wrote, adding that the company had just completed independent annual checks for HACCP certification in its food safety management system. "Food hygiene and customer service remain our overriding priorities," the company said. "We will continue to do our utmost best to strengthen our processes in both areas." 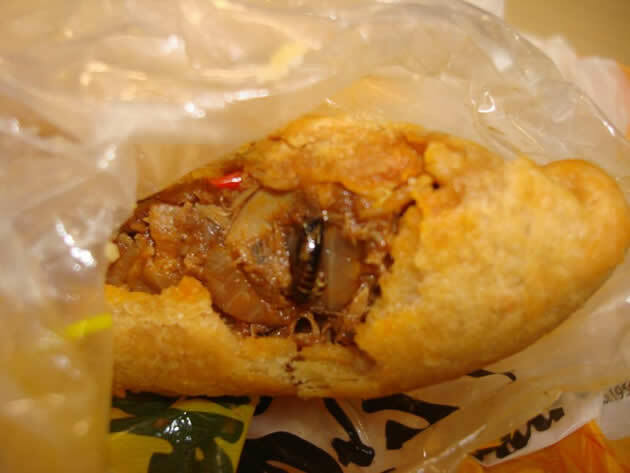 The incident caused an online furore last week when Sandra discovered a dark brown insect embedded in the filling of her sardine puff after taking a first bite into it. "She saw something that looked like a shrimp in the curry puff," said Sandra's sister Maggie, 25, who recounted the incident to Yahoo! Singapore. "But she looked closer inside and realised it was something that looked like a cockroach." Maggie, who works with Sandra as a customer support representative at Delta Airlines, said her sister's horrific find shocked all of their colleagues in the office. "Many of us are Old Chang Kee lovers too, and had themselves bought food from there that morning, but when they found out about this, everyone promptly threw away what they had bought that day," she added, saying that no one has purchased anything from the snack chain since. On the advice of her colleagues, Sandra then returned to the Old Chang Kee shop in the afternoon to complain about her shocking find. "The staff there were pretty rude, though, and one of them raised her voice against her (Sandra)," said Maggie. "One of the cooks even emerged from the back and said, 'If you want a new curry puff, just take it and go,'" she added. She said that according to Sandra, who revisited the shop on her own, staff there were not apologetic, even making observations that the insect appeared to be alive, possibly insinuating that she may have deliberately placed it inside the pastry filling on her own. They did ask her for her contact number, however, and kept the offending pastry so they could run tests on the yet-unidentified insect, Maggie said. She recounted that her sister received a call from a manager at the food chain on Thursday, where she was informed that the creature in question "was most likely not a cockroach because it was eight-legged, not six". The manager also said this was determined after the insect was sent to a laboratory for identification, but it may take several days before it determines what exactly it is. "They were totally missing the point," exclaimed Maggie, who on Thursday also decided to post the picture above on her Facebook page, to share her experience with fellow Old Chang Kee lovers. The public picture went viral, with almost 100 comments and 150 people sharing it by Saturday morning. Another user, Cassandra Teo, linked to Maggie's photo on the Old Chang Kee Singapore Facebook page -- and the administrators there responded on Friday afternoon to say they will be "investigating the matter more fully". As Sandra was too disturbed and frustrated by the entire situation to want to speak to the authorities, Maggie said she took over dealings with the Old Chang Kee management, filing a complaint with the National Environment Agency (NEA) as well. While the snack chain has yet to respond to queries, Yahoo! Singapore understands that the NEA has acknowledged receipt of the complaint, and will be sending officers to its premises once it commences investigations into the incident. In the meantime, things have not been the same for Sandra, says Maggie. "She can no longer eat meals without picking through every spoonful to check it carefully before putting it into her mouth," she said.